It is early morning and the sun is casting shadows on the monumental canyon walls leading into the Siq, a half-mile narrow passage used to enter and exit the “rose city” of Petra in the Kingdom of Jordan. Except for our Bedouin guide Zaid and the horses we are riding, we are here alone at this lovely time of day. The tourists have not yet arrived and we have Petra to ourselves, at least for a short while. The horses' footsteps echo off the walls of the red sandstone cliffs towering above us. 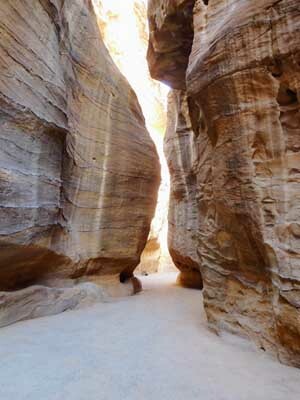 The path is only a few feet wide between these sheer canyon walls which get higher and closer as you approach the Siq. The sun doesn't shine here and not much grows. High up you may see some fig trees or oleander clinging to the brown, white, red and ochre walls. It seems almost sacrilegious to break the silence with spoken words. After fifteen minutes, we get off the horses and start our walk along the gritty road, admiring the incredible sights on both sides of us. Petra is more than 2,000 years old and has some magnificent and amazingly well-preserved buildings that were hand-carved by the Nabataean people, an Arab tribe who ruled this area for hundreds of years starting as early as the sixth century B.C. The Nabataeans were also known for their water management systems which channeled in a water supply for the inhabitants. We pass the dam that they built and which was rebuilt and reinforced in 1964 to divert the flash floods that sometimes hit the canyons. We pass some hand-carved ancient script and the weathered figure of a camel caravan, the method of moving goods along the trade routes running east to west from Yemen to the Mediterranean Sea. The best is yet to come. The Siq becomes narrower and then opens up slowly to reveal the crowning jewel of Petra, the famous al-Khazneh, or Treasury. The pathway we are on and the canyon walls towering over us are in dark shade, but through the narrow opening we can see the morning sun brilliantly shining off the pink sandstone of al-Khazneh. It is an awe-inspiring moment of revelation and mid-morning is the perfect time of day to experience it. The facade of al-Khazneh is more than 130 feet high, made of fine red sandstone and adorned with Corinthian columns, bands decorated with goddesses and deities, women warriors, eagles, ears of corn, and botanical motifs. The side panels are carved with figures of Castor and Pollux who lead the horses to heaven; to the right and left of the six central columns you can see their “footprints” climbing straight up to the sky (or maybe these are simply imprints from the scaffolding used during construction). According to Bedouin beliefs, the urn at the top contains the Pharaoh's treasure. We are not sure if at the time this was a temple or a tomb, but today it stands, a magnificent building carved into the rock more than 2,000 years ago and in remarkable condition, protected by the mountains from wind and erosion. Camels rest in the courtyard in front of the Treasury, and on the opposite wall Bedouin men have set up tables to sell trinkets to the tourists they hope will soon come along. Beyond al-Khazneh, we enter the Street of Facades, named for its many facades in the Assyrian style and believed to be tombs for ordinary people because of their small size and minimal decoration. Next, carved into a stone hill, is an impressive amphitheater which seats 7,000 to 10,000 people. And then there are the Royal Tombs, four adjoining facades on the right side of the central route through the city. One of the tombs features a grand five-story facade, another is made up of candy swirls of colored rock, and yet another has a jar crowning one of the pediments. 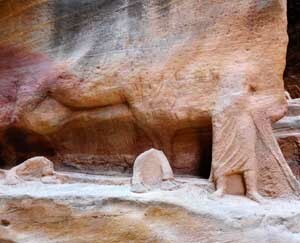 Elements of Nabataean and classical architectural styles are evident here. Dotting the hills on the opposite side of the road are hundreds of cave openings which likely were used as shelter. We are discovering that Petra is huge. It is spread over 100 square miles in the mountains and valleys of Ma'an Governate, about 150 miles south of the capital, Amman. Although you could easily spend a week hiking and exploring the site, we find that the main attractions are on an eighteen-mile route between the Siq and Ad-Dayr, the Monastery, near the top of the mountain. With the help of horses, mules and donkeys, we are able to manage it all in one day. There are 900 stone steps that you have to climb to reach the Monastery—or alternatively, you can hire a Bedouin and his mule to transport you up the steep incline. We decide to take the mule up, and walk back down. I'm pretty sure this is a good decision after seeing the faces of the people who decided to make the climb on their own power. But even with the mule it is not easy. I am not able to hoist myself onto the animal so the strong Bedouin man physically picks me up and deposits me into a saddle made of soft carpets and blankets, almost as though I am featherweight. It is a steep incline, the steps are worn to a shiny luster and look slippery, and there are sharp drop offs into the ravines far below. The mule climbs dangerously close to the edge, and it takes a fair amount of balance and stamina to ride him. We quickly learn that you must lean forward when climbing up, and backwards when going down. My guide tells me I am a good rider and stays close to my sister, who he says needs help. After what seems like an interminable ride, we finally arrive at the top and the Monastery is only a few steps away. At a quick glance, it looks a lot like the Treasury and is equally well-preserved, but the Monastery is much larger. It dates from the third century B.C. and was modeled on the Treasury, but it has niches to house sculptures where the Treasury has bas-reliefs. It too has a columned portico and the space inside was used for religious meetings; the hall was later re-used as a Christian chapel and that is how the structure got its name. On a small hill overlooking the Monastery is a “rest-stop” which offers padded benches and refreshments to tired tourists. Further along is a commanding view of the surrounding hills (jabals) and valleys (wadis) of the Jordanian countryside. It's a great view and I suspect is just as good as that from the shack farther up on the mountain peak with the Jordanian flag and hand-lettered sign claiming “Best View”. We walk back down from the Monastery, passing weary tourists who are finishing their climb up without the help of a mule. We reassure them that they are not far from the top. 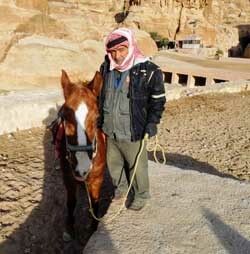 It is a very interesting walk back, a peek into Bedouin life as it once was here in Petra. 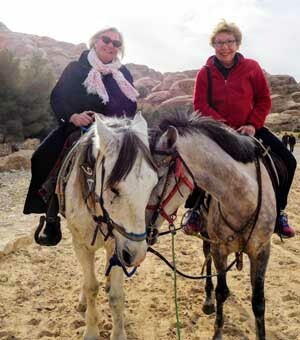 Unlike our trip up when we were riding the mules and didn't dare glance around, now that our feet are planted on “terra firma”, we are able to enjoy the awe-inspiring sights, the beautiful blue sky, and the clear mountain air. The Bedouin serve as our guides in Petra, but they no longer live here. Prior to 1985 when Petra was designated a UNESCO World Heritage Site, they lived a nomadic life in the caves we have been passing, or in tents set up against the canyon walls. Here they would raise sheep and goats and had no electricity, running water or sanitation. They rose with the sun and slept when it was dark. They wove their own material, cooked over fire, ate what they grew or raised or could buy in local markets, and lit their way with kerosene lanterns. Since Petra is now a protected national park, the Bedouin who chose to stay now live in a settlement in Petra's quarry site, Um Saihoun. They live in concrete and brick cubes that provide what they describe as a “more civilized” way of life and they come to the national park to cater to the tourist trade. They seem content with their lives. The men wear mendeels on their heads and long gowns called thaubs, and they capitalize on Petra's tourist trade by selling trinkets or rides on their camels, horses, mules and donkeys. If they are lucky to have a son, the father will conduct the negotiations with the tourists and the son will lead the animal along the agreed-upon route. The women sell souvenirs and scarves from stalls clinging to the mountainside. These women are very aggressive entrepreneurs. Even a glance in their direction solicits cries of “good price”, “only for you, madame”, and “it doesn't hurt to look”. If you do pause to look, you are offered a glass of hot sugary tea served in tiny gold-rimmed glasses; this ensures that you will stay a bit longer and hopefully buy something. Nothing is marked with a price and I suspect it will get cheaper as the day wears on. 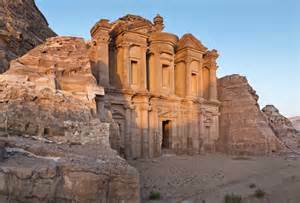 The demise of Petra from its beginnings in the sixth century B.C. is not totally clear but it is known that, after the Romans took control in A.D. 106, it started to decline as Rome opened up new trade routes and moved its colonial capital to Bostra, about 165 miles north of Petra in present-day Syria. There also were earthquakes in this area and a particularly violent event was recorded in A.D. 363. Petra was always known to the Bedouin who lived there, but to the western world it was for centuries a forgotten outpost that became known as the “lost city”. In 1812, it was re-discovered by Swiss explorer Johann Burckhardt who rode into the city disguised as a Muslim holy man and opened up this part of the world to us. 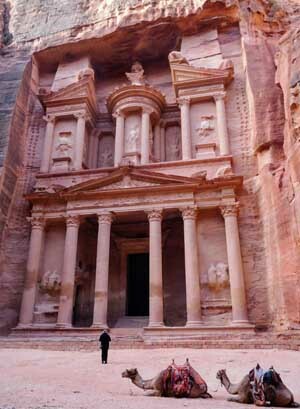 In 2007, Petra was named amongst the New Seven Wonders of the World. There is no doubt that it should be on everyone's “bucket list”. Moevenpick Resort Petra (at the entrance to Petra), 214 Wadi Musa, Petra 71810, Jordan. A substantial breakfast buffet is included with the price of the room. Rami Ahmaed (tour guide out of Az-Zarqa, a suburb of Amman), rumrami@yahoo.com. We highly recommend Rami to take you to see the sights of Jordan. He is dependable, an excellent driver and a knowledgeable guide. Is it safe? Jordan is surrounded by war-torn countries and has suffered from its own terrorist attacks. And, in light of the recent attack in Kerak, 75 miles south of Amman, the U. S. Department of State warned that tourists “must consider the risks of travel to and throughout the country”. But we felt safe there and found the people to be warm and welcoming. There is a high level of security throughout the country, on the roads and in all hotels, and the tourist police are highly visible. As in many countries in today's world, tourists should exercise caution and follow the instructions of the local authorities. It is strongly advised to stay away from areas close to the Jordan/Syria border. About the author: Elizabeth von Pier loves to travel. After she retired from her lifetime career in banking, she started traveling seriously, photographing the sights she saw, and writing about her experiences. You can find her articles in In the Know Traveler, Go Nomad, Wave Journey, hackwriters.com, travelmag.uk.com, and Travel Thru History. The Japanese love to give gifts, often for no reason at all, and we found that even the smallest purchase from a street vendor came nicely wrapped.